The new Enemy Front "story trailer" offers a look at the narrative behind the game about an American war correspondent who moves and fights with Resistance groups in occupied Europe during the Second World War. My interest in shooters set in World War II faded some years ago, but this new Enemy Front trailer has my attention because it promises something different: A behind-the-lines tale about the Resistance against Nazi occupation. It also claims to offer more than the usual bullet-sponge run-and-gun nonsense by letting players operate as snipers or even stealthy saboteurs. 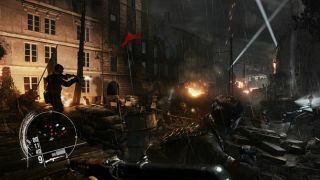 The trailer itself is a formulaic concoction, exemplified by the slow build-up to soulful music laid over explosions and gunfire, but setting a significant portion of the game in the Warsaw Ghetto is a ballsy move. It was a place of unimaginable suffering and deprivation during the war, and in 1943 it was razed by German forces, leading to tens of thousands of deaths and deportations to concentration camps. The big question, at least in my mind, is how that will be presented in the game; my hope is that it won't be turned into just another flimsy excuse to shoot Nazis. It's also interesting that the black-and-white "photographs" in the trailer, presumably intended to represent the lead character's work as a journalist, are all (or at least nearly all) of German soldiers rather than Resistance fighters. Is there significance to that, or is it just an effort to put forth something more immediately recognizable than a guy with a beret and a Tommy gun? I very much hope it's the former. Shooters are a dime a dozen, but shooters with some modicum of sophistication are an entirely different and much rarer beast. Enemy Front is being developed by Polish studio CI Games, formerly known as Sniper: Ghost Warrior developer City Interactive, and comes out on June 10.